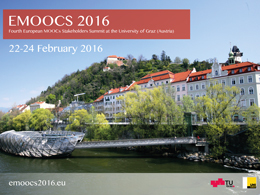 We are getting closer and closer to the conference date – EMOOCS 2016 will happen from 22th – 24th of February. Don’t forget to register for the conference. Posted in: e-Learning, MOOC, TUG, Veranstaltungen.